Reining competition closed the week at the FEI World Equestrian Games™ Tryon 2018 with great performances and big scores as some of the world’s best riders battled it out for the FEI medals at the Johnson Controls Individual Reining Competition finals. When the curtain fell upon the TIEC Indoor Arena, the dream team made up of Bernard Fonck (BEL) and What A Wave once again made history by claiming the gold medal for Belgium with a perfect execution of pattern #12. The Belgian rider has won close to $1,800,000 in reining competition and his mount, an 11-year-old American Quarter Horse stallion owned by Gina De Pauw and Steve Vannietvelt, who has left his mark in many an international arena with Fonck in the saddle, scored a 227 for the win claiming the highest step of the podium. “This is the first time in history that a European rider leaves the World Equestrian Games with the individual gold medal and I could not be any prouder,” said Fonck. “What A Wave is the sweetest horse I have ever had the pleasure of riding. I am very fortunate to have had more than one ‘once in a lifetime’ horse, and he is at the top of this list. Every time we show, he gives me all he has and every time it gets better and better. When I came here I knew that we could probably make it to the top five positions but I would have never imagined that we would claim the gold.” . 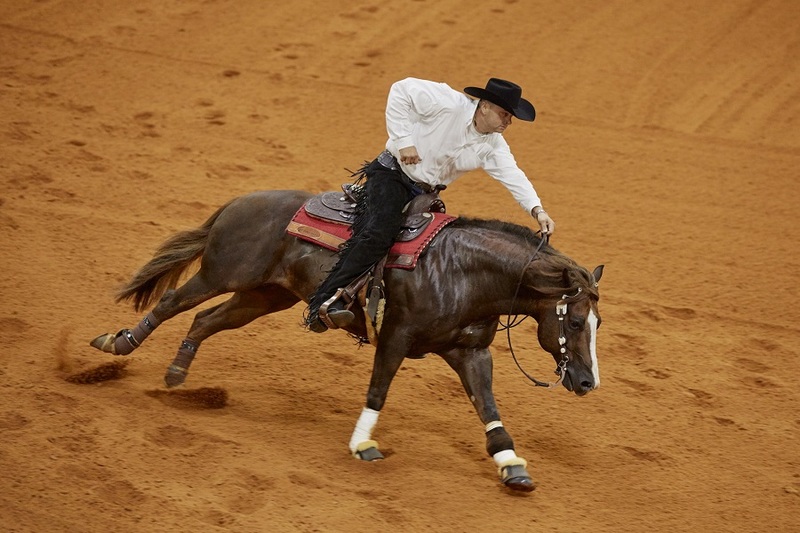 Team USA’s Dan Huss and his double-registered American Quarter Horse and American Paint Horse mare Ms Dreamy, owned by Frederick Christen, set the crowd on fire as they burst into the arena setting the dirt flying and spinning fast to mark a 226.5. The duo clinched the silver medal and they too made history: The talented 8-year-old horse is the first mare to earn an individual medal in reining at the FEI World Equestrian Games™. A run off determined who would take home the bronze medal as both Cade McCutcheon (USA), riding Custom Made Gun, and Joao Felipe Lacerda (BRA) aboard Gunner Dun It Again scored a 225 during the finals. They returned to the arena to battle it out and both horse-rider-combinations once again thrilled the crowd. Fighting until the bitter end was 18-year-old Cade McCutcheon aboard Custom Made Gun, the flashy 7-year-old double registered AQHA/APHA palomino stallion owned by his grandparents, Tim and Colleen McQuay. Having topped the first individual qualifier with an outstanding 229 score, the pair was last to go in the seeded Individual finals. Once it was time to ride back into the arena, they performed to a 228 score and firmly captured the bronze medal. Amazingly enough, both Gunner Dun It Again and Custom Made Gun were both bred by McCutcheon’s grandparents and they are both by the legendary stallion Gunner (AQHA Colonels Shining Gun) and out of two mares by yet another stallion that has made history, Hollywood Dun It. Both stallions are owned by the McQuays. Reining competition at the FEI World Equestrian Games™ Tryon 2018 will go down in the history books as the event that showcased some of the world’s most talented reining horses guided by the some of the world’s elite western horsemen.